I used to make bone broth on the stove top and simmer it for 24 hours. 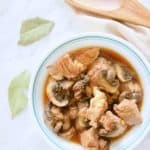 Ever since I got an Instant Pot, I’ve used it to make bone broth instead! 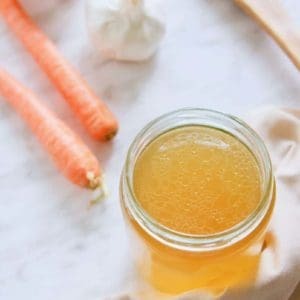 Why would you make Instant Pot Bone Broth? 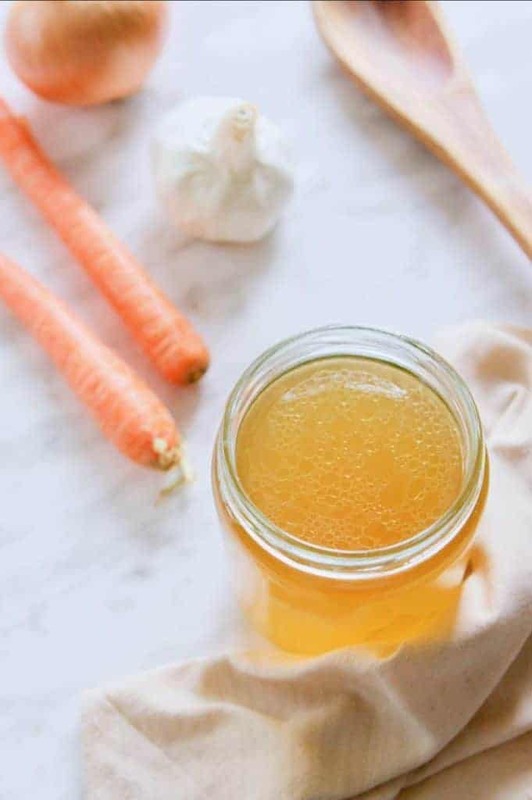 Bone broth has collagen which has been found to help with leaky gut. 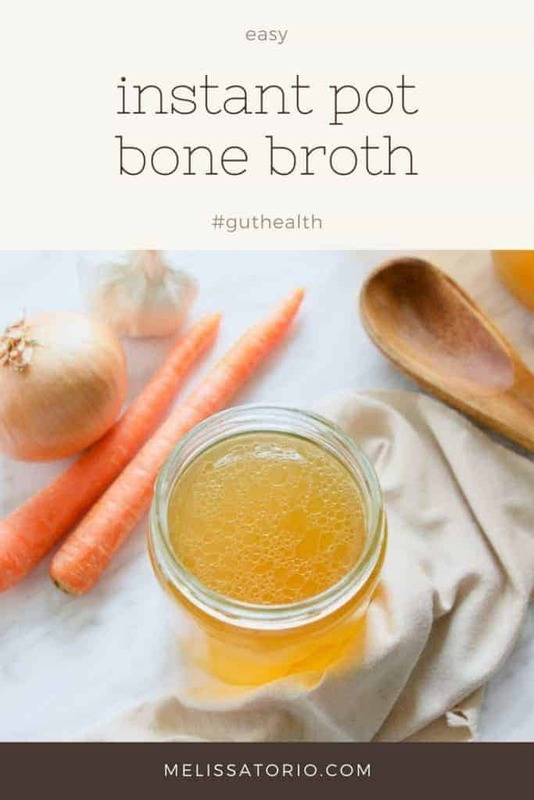 Read more about the benefits of bone broth here. You’ll need soup bones with marrow, preferably from grass-fed cows. When using beef bones, you may also want to roast them in the oven at 450°F for 30 minutes. This will enhance the flavour of the bone broth. You can also use the carcass of a roasted chicken instead. Or use both beef and chicken bones. Next, you’ll need carrots, celery, onions, garlic and bay leaves. When using organic onions and carrots, no need to peel them, just roughly chop into smaller pieces. Add small pieces of kombu to add more minerals into the bone broth. 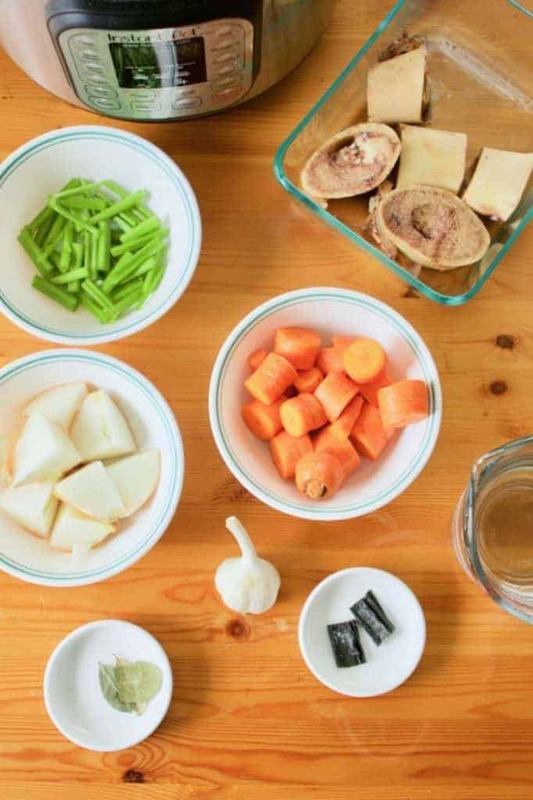 Tip: Save your veggie scraps and mushroom stems for this bone broth! 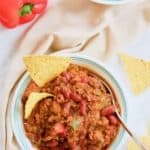 Place all the ingredients into your Instant Pot. Add water just until 1 inch below the max line. Add the apple cider vinegar. This will help extract the minerals from the bones. Press the manual button and set the timer to the maximum setting. Might be 120 minutes or 240 minutes depending on your Instant Pot. Tip: Press down until you reach zero, then press down again. 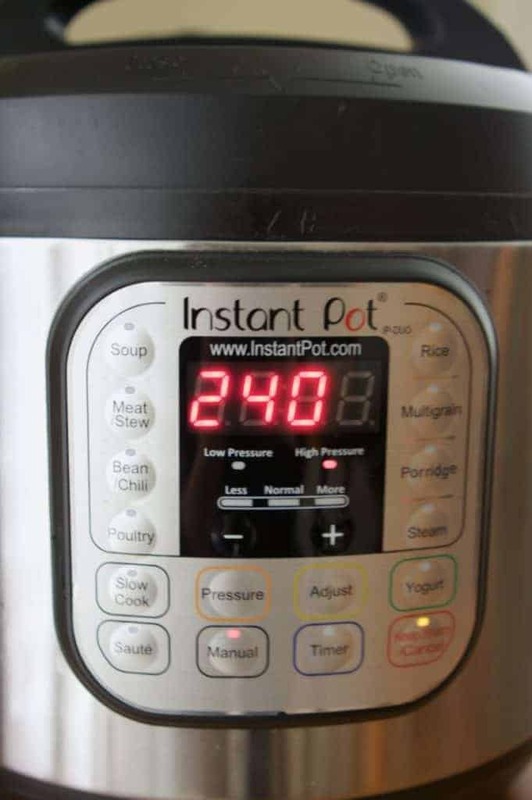 That would be the maximum setting on your Instant Pot. When the bone broth is done, let the pressure release naturally before opening the pot. Strain out all the solids. Compost them as all the nutrients would already have been extracted into the broth. 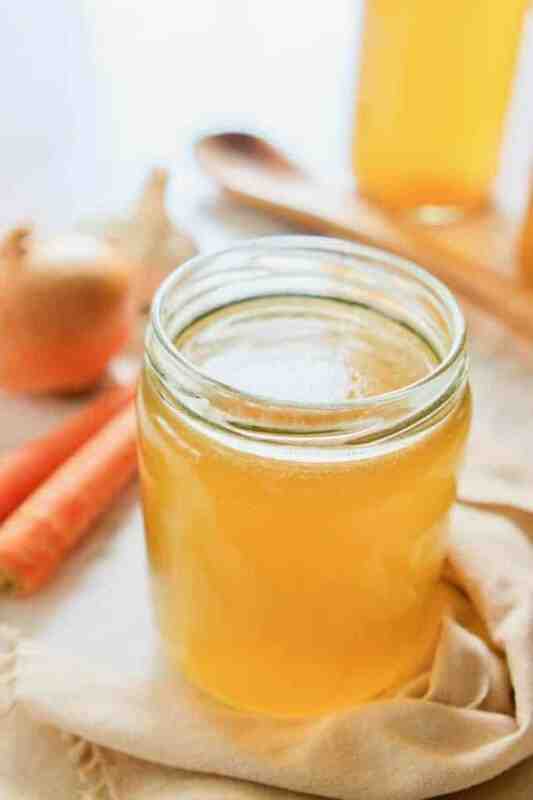 Pour the bone broth into glass jars. When freezing, leave about an inch or two of air space at the top to prevent the jar from breaking. Or freeze into ice cubes so you can use as needed. How can I enjoy bone broth? Drink a cup of bone broth a day to help heal leaky gut. Use it as a soup base. 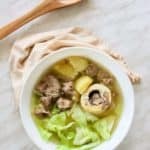 Have you tried this Instant Pot Bone Broth recipe? Please leave a comment and rating below! Make bone broth in an Instant Pot and have it ready in no time. Optional: Roast beef bones in the oven at 450ºF/230ºC for 30 minutes. 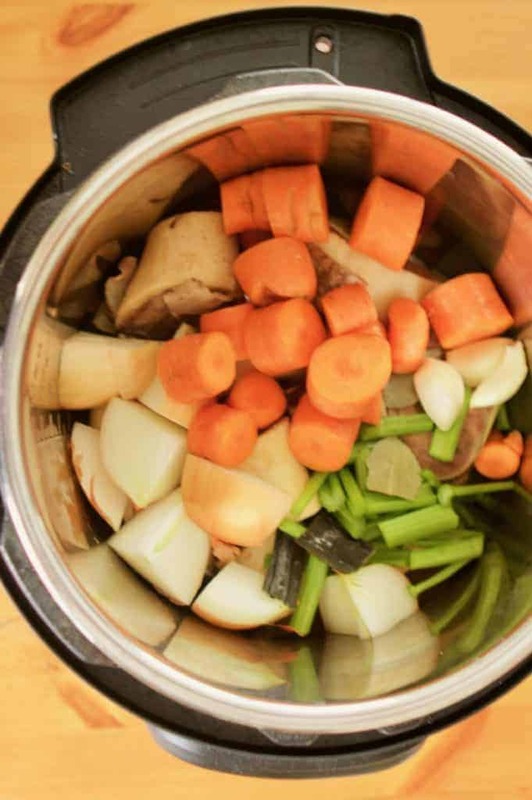 Place bones, carrots, celery, onion, garlic, bay leaves and kombu in the Instant Pot. Add water until 1 inch below the max line. Set to manual mode for 2 hours (or 4 hours if your Instant Pot allows). Strain out all the solids. Pour broth into glass jars. Store in the refrigerator or freeze. If freezing into glass jars, leave 1-2 inches of air space at the top to prevent the glass from breaking. Bartlett, Emily, L.Ac. The Eczema Cure: Heal from the Inside Out. N.p. : Holistic Squid, n.d. 28. Holistic Squid. Web. 20 Oct. 2016.